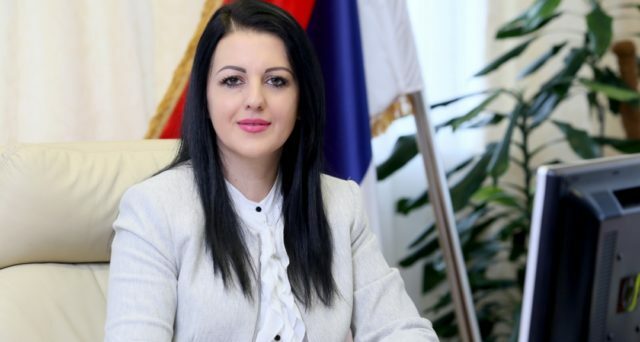 The Ministry of Family, Youth and Sports Sonja Davidović in an interview for our portal, talked about situation in sports in Srpska, the demographic picture and plans in the future work. TST: You are elected as the President of the new convocation of the Councile for the Demographic Policy of Republika Srpska. What measures would you take and propose to the Government of Republika Srpska in terms of demography? DAVIDOVIĆ: After taking term of office, I set the priorities with associates, and one of them is to undertake specific activities when it comes to demography and population policy. We are aware of the complexity of the situation and the need to apply the measures which will very soon give the results. The first step that we have taken is the formation of the Council for Demographic Policy consisting of line ministers, experts in the field of demography and representatives of the institutions involved in demography. We also established an expert team which will deal with the analysis of the demographic situation and propose concrete measures which will be proposed to the Government of the Republic of Srpska by the Council for Demographic Policy. We expect those measures soon, because the expert team was given the task to analyze the current situation and to propose tangible and intangible measures which we would present to the Government. We intend to actively include the local communities in the whole story about demographic activities, because they have much to do in this area. We also decided to establish cooperation with the Republic of Serbia, in this area, and, in early April, we will sign Memorandum on Cooperation with the Ministry without portfolio, which is in charge of demographic and population policy. Demographic situation in the Republic of Serbia and in the Republic of Srpska is equally complex and we believe that, by exchanging experiences and ideas of experts in this field from Serbia and the Republic of Srpska, we will come to concrete and effective solutions which will improve the demographic situation in the Republic of Srpska. TST: Sport in Republika Srpska is in a very bad situation. How are you planning to improve the sport in Srpska? DAVIDOVIĆ: We are aware of the complexity of the situation in the field of sport and we have already taken concrete steps and we changed the Rulebooks in order to partially restore order when it comes to the financial responsibility of the clubs, accounting for resources, financing on the basis of the results achieved. Big task is in front of us and we are committed to implement all the activities that we planned, step by step. We talked to the representatives of sports federations of the Republic of Srpska and I would assess this meeting as very constructive. It is important to us to hear all the actors concerned by our activities, in order to comprehend the situation from all angles and to finally come to appropriate solutions for all. Drafting of the new Law on Sports is in the process, which will enable us to solve the issues such as financing the federation, sports organizations and manifestations, as well as the problem of under-educated sports staff. Through regulations, the Ministry will seek to precisely define the legal status of professional athletes and amateurs, as well as the control of healthcare of athletes. TST: Bringing of sports law has been a priority for a long time in Srpske. Will it finally come to that soon? DAVIDOVIĆ: Applicable Law on Sports has been applying for 17 years and it is the time to draft a new law and we already started with the procedure. The first meeting of working group for drafting a Law on Sports was recently held and it was attended by the Minister of youth and Sports, Vanja Udovičić, and he wanted to give us firsthand specific information and to tell us about the experience of Serbia, who has been applying the new Law on Sports for three years. I am really grateful to Minister Udovičić who selflessly helped us by wanting to facilitate this significant work, and the experience which he has is valuable. We will soon start the expert discussions in all six regions of the Republic of Srpska in which all citizens, who are interested in this theme, would participate together with the sports audience and workers. The Law should appear, in a form of draft, before the Members of Parliament in the last quarter of the current year. TST: One of the problems in Republika Srpska is the problem of leaving young people from the country. How to solve this problem and offer youg people a better perspective to stay in thir own country? Government of the Republic of Srpska is committed to create as favourable conditions for young people by implementing different projects through ministries, but I also think that we, all together, have to try to create a positive atmosphere and to give a chance to certain projects to become active, to start to show results before we criticize them. Problem of departure of the population is something that countries which more developed than the Republic of Srpska are also facing and we are ready to face that challenge and to offer the concrete solutions. For 11 years Ministry of Family Youth and Sports has been implemented a special program of interest rate subsidy for residential loans for young people and young married couples, by which we directly helped to 3 398 beneficiaries to pay their residential loan. We have allocated BAM 9.7 million so far for that purpose. When we speak about employment, Ministry of Labour and War Veterans and Disabled Person’s Protection puts a special focus on the young population of the Republic of Srpska, through the Employment strategy of the Republic of Srpska, and there are also different programs of support for employment and initiation of own business. Above mentioned Ministry and Employment Office of the Republic of Srpska implement a program to encourage the development of entrepreneurship among young people up to 35 years of age “START-UP SRPSKA”. Value of the program is BAM 2 million, and it is financed by donor funds of the Government of the Republic of Serbia in the amount of EUR 500,000 (BAM 977,915) and through funds of the Employment Office of the Republic of Srpska in the amount of BAM 1,022,085. The objective of the program is to support development of entrepreneurship, sustainable economic development, reduction in the number of unemployed young people by starting their own business through registration of entrepreneurship stores or companies established by young people up to 35 years of age. We work, and we will work even more, to create a better environment for stay in the Republic of Srpska. TST: What are your primariy goals in the future work? DAVIDOVIĆ: Apart from continuing the same pace, when it comes to the initiated projects, we also plan to sign the Memorandum on Cooperation with Provincial Secretariat for Sports and Youth of Vojvodina, as well as organization of the second Sport Fair of the Republic of Srpska. We have entered the procedure of amendments to the Law on Protection against Domestic Violence and preparation of the Strategy for the Development and Promotion of Volunteering. We also initiated the new project “Otvorena vrata” (Opened Door) by which we want to improve communication with citizens and to give them the opportunity to present their ideas and to candidate the projects which they consider useful for a wider community. I invite all citizens, who are interested in this kind of cooperation, to contact us via e-mail otvorenavrata@mpos.vladars.net, and every last Wednesday of the month we will carry out interviews with those whose ideas are estimated as useful for wider community.